In February a BBA team of three BHP juniors and one iMPA junior competed in the Marshall International Case Competition at USC. Only 17 top-ranked international and U.S. business schools were invited to participate in the competition. Although the McCombs team did not make it to finals, they performed well and placed second in their prelim room. Teams of students represented schools such as University of Pennsylvania, University of Virginia, and Washington University in St. Louis. International competitors included Copenhagen Business School, University of Auckland, and National University of Singapore. The format for the competition was a 15-minute presentation with 10-minute Q&A. Teams had 24 hours to read the case and develop their solutions. This year’s case focused on Intuit, a software company that creates financial tools for consumers and small businesses. Intuit’s most popular products are TurboTax and Quickbooks. The case asked teams to predict the needs of small businesses in 2026 and help Intuit prepare to meet those needs. Teams could recommend adaptations of Intuit’s existing products, suggest a new product offering, pitch a merger/acquisition, or come up with other ideas. The team had a phenomenal time seeing the Los Angeles area, and meeting teams from domestic and international schools. They were able to spend time in Santa Monica and visit The Getty Museum. One of the organized outings for competitors was to a barbecue restaurant in L.A. for dinner. The Texas team was asked many times by other teams how the barbecue compared to Texan fare. The team happily told them Texas barbecue was better. 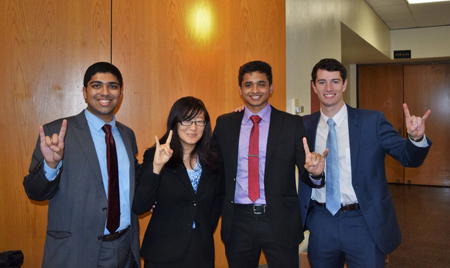 The competition was a great experience for the four students who represented McCombs. “We learned a lot from the other teams and how they approached the case,” said Saldanha. “For example, non-U.S. teams placed a lot more emphasis on international markets and the needs of businesses in developing economies.” The team relied on each other’s strengths to come up with their solution in the allotted 24 hours and to confidently present it to the judges. Student travel to case competitions is supported through generous donations to the Business Honors Program. Thank you to our alumni, whose support allows students to have enriching experiences such as this one. If you would like to make a gift to the BHP Alumni Endowed Excellence fund, click here. This entry was posted in News, Program News and tagged Eric Saldanha, Marshall International Case Competition, McCombs School of Business, Texas BHP. Bookmark the permalink.